The Residences at Marina Gate 1 by the Select Group, launched in 2014, is now complete and ready for handover. PW visited some of the fully furnished apartments and found that the newest tower in the Dubai Marina does complete justice to the prime location it enjoys. With a built-up area of nearly 1.14 million sq ft, the development features 399 residential units, including studios, one-, two-, three- and four-bedroom apartments, four-bedroom penthouses and duplex podium villas. 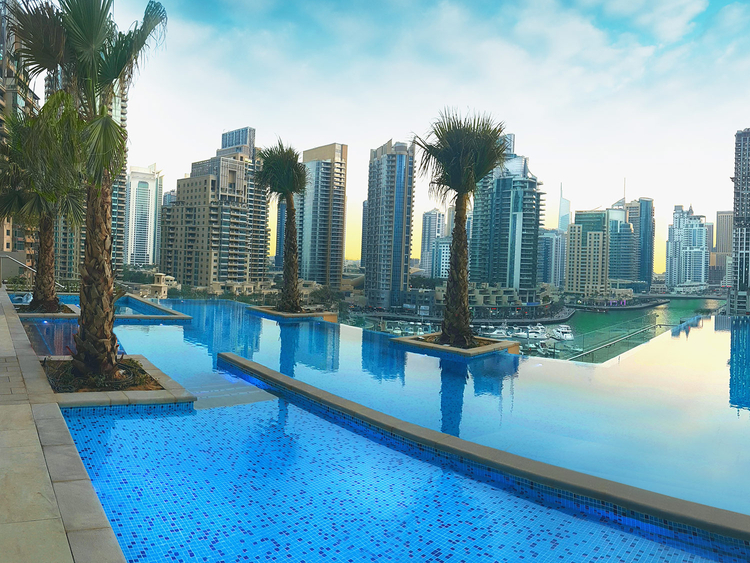 With its strategic location, many of the units offer views of golf courses, the Dubai skyline and the Dubai Marina. The building keeps in mind the needs of the residents and maximises indoor space with high ceilings and right angles. He emphasised that Marina Gate 1 would be attractive to both investors and end-users, “anyone who appreciates the good life, who values class, luxury and premium lifestyle”. With direct access to the buzzing Marina Walk, families living here will have a host of recreational activities to choose from, be it a leisurely evening stroll or a morning jog on the water’s edge or hopping onto a water taxi to go around the World Islands or the Burj Al Arab, indulging in an afternoon of angling, or better still, spending some time at a café with friends. “We have a large number of three-bedroom units, almost 76 of them, to ensure we have a lot of families living here. We want to have the right mix of people that live up to the expectation of the community that we are trying to create across the three projects,” says Pooya. The three modern, sophisticated buildings of The Residences project will tower above a cluster of podium loft units with connected walkways. The towers have been designed to look neat and elegant in the daytime, transforming into a well-lit gorgeous structure at night, standing tall on the most prominent site of the Dubai Marina. Each building will have its own tropical pool deck, gym and facilities. The market has been softening since 2015 and at the moment the demand for prime property is not as strong as it was, and there are a lot more mid-market offerings. However, markets go through cycles and when you build something for the long term, you don’t worry about the short-term cycle. Talking about the second building that has topped out at 64 floors, Pooya says, “The cladding work for the second tower is going on as we speak. There will be a 10-month difference between the handover of the two towers. Hopefully by the time residents move into Marina Gate I, a lot of the noisy work will be completed for Marina Gate II. Indifferent to Dubai’s softening market conditions, Pooya says, “The market has been softening since 2015 and at the moment the demand for prime property is not as strong as it was, and there are a lot more mid-market offerings. However, markets go through cycles and when you build something for the long term, you don’t worry about the short-term cycle. The Residences at Marina Gate I is currently the newest tower in the Dubai Marina and boasts of high standards of construction and finishing, from the brilliant glass facade to the generous well-thought-out layouts of the residential units that boast of a walnut-wood-veneer finish and the brightly lit common areas. The apartments, penthouses and villas have a top-notch carpentry, with soft-closed drawers in the rooms, and have made use of premium fixtures and flooring, and luxury appliances in the kitchen and bathroom. The master bathroom in most of the units boasts his and hers sinks and a free-standing bath tub, from which one can gaze at spectacular views of the Marina skyline. The developer has also taken great care about the facilities. The gym features spacious changing rooms (pictured right) and offers waterfront views, as is the infinity lounge pool and the children’s play area. There are high-speed elevators and a 4,000-sq-ft lobby. Besides the functional floor plans, there are intelligent storage solutions and allowance for maximum daylight, and also efficient energy systems that would reduce noise levels and energy consumption. The developer said careful detail has also been paid to access points and traffic flow to ensure that the development will add value and convenience for residents and neighbours of Marina Gate. At the podium level of the tower, there is a retail colonnade that creates a lively active connection with the rest of the community without compromising the privacy of the residents. The connected walkways that connect the three towers give residents easy access to a wide range of conveniences, including a supermarket, salons and sports facilities. Amenities in the building also include a spectacular infinity pool that overlooks the marina, squash and paddle tennis courts, eight high-speed elevators with a dedicated service elevator, a direct-access loading dock, secure parking for residents, dedicated security and 24-hour concierge service. Complementing this is the wide array of retail options, ample availability of transport options and direct access to the Marina Walk. The variety of units the tower offers (from studios and apartments to penthouses and duplex villas) also provides buyers with ample choices in different price points. Studio apartments in the first tower have an area of 536 sq ft, while apartments range from 719-2,368 sq ft. Penthouses vary between 3,300 sq ft and 4,683 sq ft, and podium villas between 1,999 sq ft and 5,415 sq ft. Almost 95 per cent of the development is sold out, including the studios, one- and four-bedroom apartments and podium villas. There is limited availability for the rest, according to Select Group.